They were nice enough to offer money for bank fees . . . They got their cash, so I got a pat on the back. You often meet travellers in ‘strife’. They’ve either been robbed, pick-pocketed, lost stuff through customs, or had bank cards replicated by ATM sensors or camera recordings of security PINs. Of course, some simply run out of money. Then there’s the ATM walk-off, without your bank card – that’s what happened to me. I was being extra careful. I watched my back for crooks, I read the Spanish ATM and I did the peso to dollar mathematics. Then I forgot the final step. ATMs are different in Argentina; they give your bank card back after the banknotes – not the other way round. So, I took my banknotes and walked off. I arrived in Puerto Iguazu a little hungry. I locked my backpack in a ten-bed dorm, then overheard a mid-twenties Australian man, “I’m here doing voluntary work,” he said. That’s nice. This guy’s come to Argentina to help the poor kids. I hurried off to the bank to resolve my issues. Puerto Iguazu’s banks aren’t like the First World. There’s just the one of them. This closed at 12:00 o’clock. I arrived at 12:05. Puerto Iguazu’s bank sits on the main concrete street. There was no other bank in sight. I turned off this street, then, after two blocks, it turned into a terracotta-coloured dirt road. There were paint-deprived, concrete-box homes, most without borders, although some had chicken wire fences. My card had ‘Emergency MasterCard’ written on it. It was sent 48 hours after I lost my last one. The following day, I approached the bank’s counter with my passport and plastic. ‘Yo quiero 500 pesos?’ I said. The counter girl’s head moved from left to right. What you talking about, ‘No’? Back at the hostel, I sat eating bread, ham and cheese. This was part of the complimentary breakfast. While eating breakfast, I noticed an Israeli man with scruffy brown hair, who packed extra bread aside for his lunch. Today I did the same. He was in his mid-twenties with unshaven stubble, and travelled with a small group. ‘We’ve juzz finizzed ze army,’ he said. He was sitting alone at this point. He was a skinny man who called himself ‘David’. ‘Eight yearz in ze army,’ he told me. He pointed to a brunette girl sitting with his friends, ‘She’z za singer in za army.’ His other friends stuck to themselves, although each of them, at some point, did manage to tell me about their army achievements. Until now, this hadn’t crossed my mind. Karen said I needed twenty-dollars ’cause the Falls were in Iguazu’s National Park. Neither Karen nor I knew. The hostel receptionist told us it’s Guarani for water and the Guarani Indians were at the falls before Spain. Karen focused graciously. I just chewed my bread. I could hear the ‘volunteer’ worker, whom I’d met previously, talking from time to time, but I couldn’t pick which part of Australia he was from. He was aware of my situation. It’s common to meet volunteer workers – from the First World – in Argentina. They teach languages, assist with building basic homes or prepare food for the hungry. Some have professions to offer. I’ve seen photography of programmes with children with innocent, Latin smiles by photographers who were ‘volunteers’. I’ve read creative writing about scenes surrounding the lives of the poor by journalists, who were also ‘volunteers’. For some there’s no link to their career. ‘Yes, I am,’ he replied. ‘Listen mate, I’m in a bit of a fix. I’m a bit hungry to be honest. We’re with the same bank back home and I’m wondering if I can deposit money into your account.’ His blue eyes became worried, hiding behind a ginger fringe. ‘I’m not sure how that works,’ he said. ‘I’ll have a read about it,’ said the ‘Volunteer’. Just outside the hostel were small souvenir stores and tourism businesses promoting Iguazu Falls. It was Puerto Iguazu’s centre. Concrete roads passed through a few streets with a combination of dirt and grass patches at their edges. Some roads were marked with the remains of orange dirt carried by tyre treads from dusty connecting roads. The homes on concrete streets had more security than homes on the near-by dirt roads. This included concrete fences with smashed glass cemented to their tops: green, brown and clear broken bottles were common. A few blocks walk from town I could hear the sounds of birds and the occasional passing car. I was interested to see where the cars were going and if there was anything to explore. Eventually, I saw sunlight glinting off water and wondered if it’d lead me to the falls. The short glimpse of water was brown, and passed through predominantly green hills with red soil at the water’s edge. From one side of the water’s edge to the other was around 80 metres. I later found the falls were 18 kilometres from here. My walk eventually took me to a point where two rivers created a T-intersection. I read a plaque, which called this junction ‘Tres Fronteras’ or ‘Three Frontiers’ in English. This was where the Iguazu River and the Parana River meet to form the borders of Argentina, Brazil and Paraguay. I stood there, in Argentina, looking at Brazil and Paraguay, both within 100 metres. Back at the hostel, I was greeted by the pretty, brunette receptionist. ‘Did you like las cataratas?’ she said. So, I explained my situation. There was a swimming pool in that hostel, around two metres from where we were speaking. Don’t throw him in there yet; he might just change his mind. ‘No worries,’ I said, and walked off. Karen had heard I was in trouble. She told me she’d be happy to help. Her bank was different from mine, but since it was still domestic, it’d be just a three business day wait. I did the transfer and gave a little extra for bank fees. She better not run away. I wasn’t sure why Karen spent that weekend in Puerto Iguazu; she’d already seen the falls. David got up early Saturday morning. I woke to see him doing push ups in the dorm. His arms were white and scrawny, with a braided, dark leather bracelet on his left wrist. It was amusing his confidence to do push-ups in a ten-bed mixed dorm. He was fatigued at eight push-ups, but I think he ground out ten. I sure hope he never runs out of ammunition back in the war. If he says ‘Yes’, it can’t have been for long. David sat down on his bed beside mine. People were still sleeping. ‘I’m leaving today,’ he said. He had a small yoga roll with what appeared to be a nylon bag packed with small aluminium poles. ‘You can have zis tent,’ David said, while passing me the nylon bag. ‘Azz a mattrizz, too.’ He told me he was heading to a larger city and nearing the end of his trip. Then he handed me a six-inch packet of Oreos. ‘Now you av somezzing to eat.’ It felt nice to know he’d been thinking of me. Three business days later, Karen handed me my cash. I had just enough to get across the Brazilian border to Foz do Iguacu; you can still see the falls from there. Although, when I arrived in Brazil, my Emergency MasterCard was met with: ‘I don’t know this transaction.’ So, I was back in ‘strife’. With help from that ‘Volunteer’ I’d have learned more about Iguazu Falls. Instead, I learned that volunteers aren’t always as helpful as their title implies. Copyright © 2013 Caviar Literature. Previous Previous post: Raw travel writing from Brazil: Gringo in a favela. Travel literature / travel writing by an Australian travel writer. Next Next post: Travel Writing / Travel Literature: the essential elements. I don’t know where I would be without the kindness of strangers / fellow travellers. And for that reason I’m usually willing to help out anybody. There are two ways to view strangers. As potential friends or as potential enemies. Unfortunately many people choose the latter. Thank you for enjoying my writing. I really did get hungry there at one stage. I’m still in South America, though. So, I can’t complain. 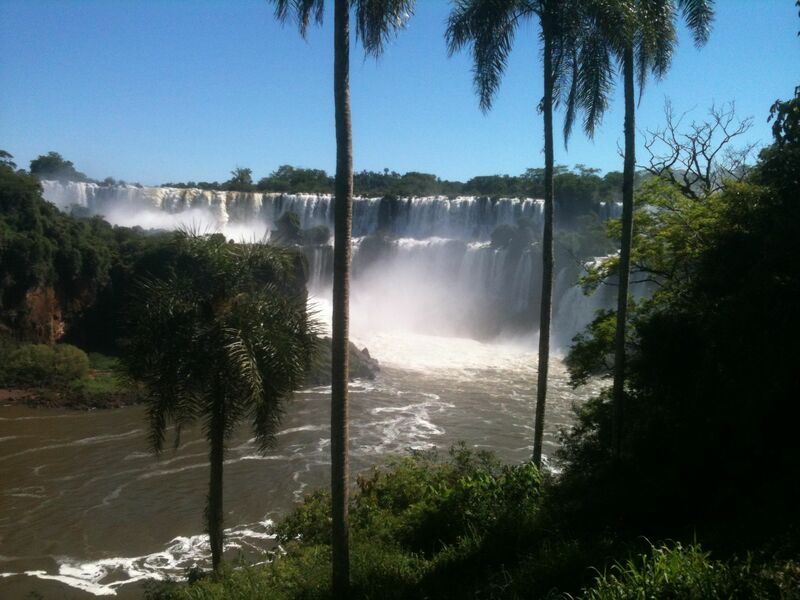 A quality travel narrative from Buenos Aires to Iguazu Falls.